The "Cram Roofing Ball Drop" is a one-of-a-kind fundraiser held within the Boy Scout Charity Golf Classic where four lucky winners could take home up to a combined $4,800 in prizes. Sponsored golf balls are dropped from a crane at the Hyatt Hill Country Golf Club. The four closest balls to the pin will be the big winners. All proceeds from the Cram Roofing Golf Ball Drop will benefit Scouting programs at the Boy Scouts of America, Alamo Area Council. Golf ball sponsorships are $10 each and balls will be sold up until tournament play. Each golf ball will be numbered in sequential order and placed into a special hopper for the drop. The number on each golf ball will correspond to a number that matches each participant when they register. *If less than 1200 balls are sold, prize money will be based on equivalent percentages of total sales. Gift card prizes will be awarded to the four balls closest to the pin. 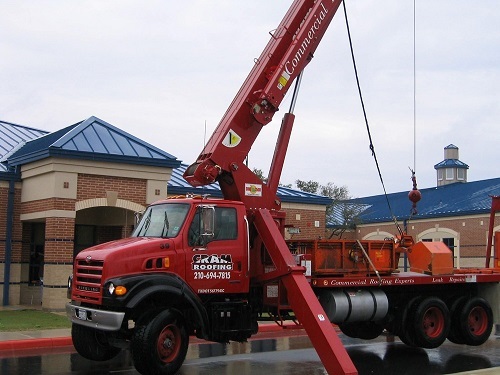 Golf balls will be dropped from a crane, approximately 40 feet, at the Hyatt Hill Country Golf Course. The four numbered golf balls closest to the hole will win. The closest ball will win the grand prize. Second, third and fourth places will be awarded to the second, third and fourth closest balls to the pin. In the case of a tie, the purse will be combined and split equally. Official golf ball number assignments will be posted before the event. No balls will be sold after the deadline has passed and all number assignments are final. The golf ball drop winners will be determined by Cram Roofing, assisting members of the Alamo Area Council and witnessed by a Notary Public. The prize money will be awarded based on the following percentages of gross ball sales: Grand Prize = 20%, 2nd Place = 10%, 3rd Place = 6%, and 4th Place = 4%. Prizes will be determined based on the total number of golf balls sold. All federal, state and local taxes are the sole responsibility of individual winners. Winners may be required to sign an IRS Form 1099 or the equivalent for all prizes valued at more than $600. Congratulations to our 2017 Cram Roofing Ball Drop Winners! Congratulations to our 2016 Cram Roofing Ball Drop Winners! Congratulations to our 2015 Cram Roofing Ball Drop Winners! Congratulations to our 2014 Cram Roofing Ball Drop Winners! 4th Ball Closest to the Pin winning $182 - Robert Divin, Jr.
Congratulations to our 2013 Cram Roofing Ball Drop Winners! Purchase a Golf Ball here!